As home appliances and multimedia electronics get slimmer each day, the furniture we use for placing them also gets leaner. Same goes for televisions as they transform from super heavy CRTs to the lightweight LCDs and finally to the super slim LEDs. A television stand wasn’t just a necessary furnishing product in the past but even today, home and office furnishing are considered incomplete without it. The TV stand that was once an ordinary furniture item used for holding television has become one of the necessary parts of home decor and office in the modern day. If just like several other homeowners you too are looking for TV stand(s), then read AmerAdnan’s guidelines below to develop better understanding of buying television stands for your home and office. Why Consider Buying a TV Stand? Do you think it’s unnecessary to buy a television stand because you want to hang your LCD/LED on the wall via wall mount? Like you, there are many people out there who are confused whether they need to buy a TV stand or not. Well, majority of the people these days hang LEDs on the walls, but they never ignore the importance of a TV stand/rack. These smaller but full entertainment centers have enough shelves to store a few components along with media. Whether or not you hang TV on the wall, you will always need something to hold your DVD/USB player, cable box, video game system and other equipment, which is why, a TV stand is considered as a crucial part of home and office furnishing. The size of a television stand is dependent primarily on the TV size, room size and your personal requirements. It is therefore, necessary to know the size of the television and room where the stand has to be placed/fixed. You should always make sure that the television is hung/placed along the length and not the width of a room. After you are done with the measurements, it is important for you to know your storage needs. If you have a DVD/USB player, a gaming console, a hi-fi sound system, some books and other smaller equipment to place on the TV stand, make sure to buy the one with greater storage capacity such as shelves, cabinets and drawers. For those who do not have much to attach with the television, even the smart and minimal stands can do the job. Furthermore, those who want to save maximum space in their smaller rooms, they can find corner TV stands at modern home furnishing stores. Whether it’s in the center of your living room, waiting lounge of the office or tucked away in the den, make sure your TV stand should perfectly blend into your home’s or office’s decor. The TV stands these days are made of different materials that mainly include wood and metal. The metal TV stands usually have glass shelves whereas wooden stands are made out of double-sided laminated wood that comes in different shades and styles of wood grains. 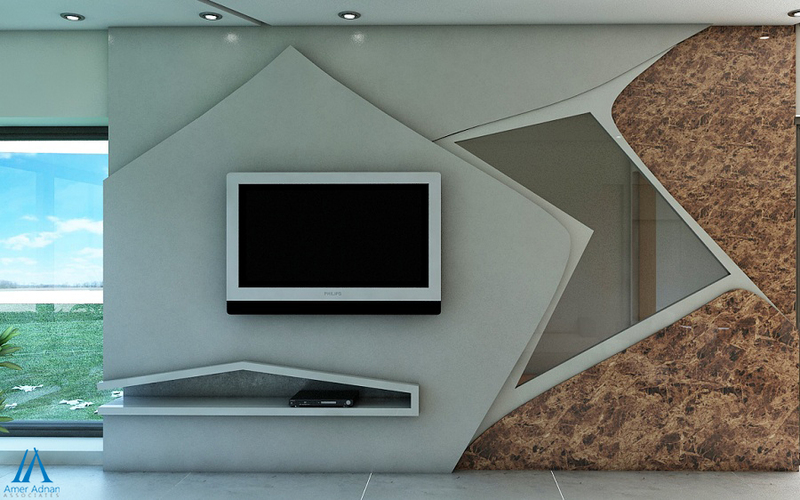 The interior designers in Pakistan suggest making a perfect match or contrast of the TV stand with the room’s interior.